On April 7, 1940, Booker T. Washington became the first African American to be depicted on a United States postage stamp. Several years later, he was honored to be on the first coin to feature an African American, the Booker T. Washington Memorial Half Dollar. But how did this slave turned orator and leading member of the African American community achieve this? Booker T, known as “Booker,” was born in 1856 in southwest Virginia. He was born into slavery. Although all slaves were emancipated in 1865, life remained difficult for Booker. He worked in salt furnaces and coal mines in West Virginia for several years to earn money. Eventually he traveled east and was able to attend Hampton Institute, a school established to educate free men and their descendants. He had little money to pay for tuition, so he worked to pay for his studies. He also attended Wayland Seminary in Washington, D.C.
Education was very important to him, so when he was invited to teach at Hampton Institute, he quickly agreed. It was in 1881 that the Hampton Institute president Samuel C. Armstrong recommended Washington to become the first leader of Tuskegee Normal and Industrial Institute (later Tuskegee Institute, now Tuskegee University), in Alabama. The new school opened on July 4, 1881, with Booker T at the helm. In the beginning, the school focused their curriculum on teaching students basic skills to take back to their mostly rural black communities throughout the South. 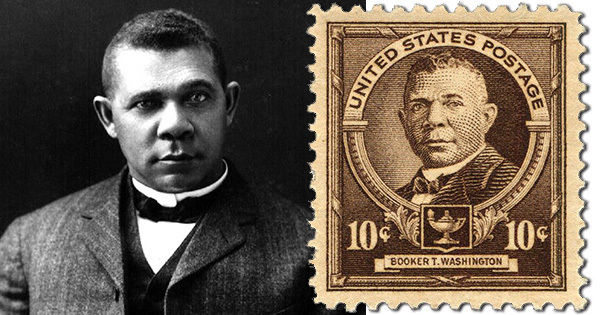 Booker's goal was to educate blacks so they would eventually gain full participation in society as responsible, reliable American citizens. The school thrived under his leadership and added more programs and eventually was named Tuskegee University, and its endowment grew from $2,000 to over $1.5 million. By this time, Washington had become an influential figure in the African American community, but he was also influential among wealthy white philanthropists and politicians whom he would not hesitate to approach for support with education for blacks. Washington remained at the school for 30 years. His reputation grew, not only as an educator, but as an outspoken supporter of social and educational issues for Blacks. He gained the respect of national white leaders in politics, philanthropy and education, even serving as a consultant on issues of race. As a result, he was awarded honorary degrees from leading American universities. He continued his work until his death in 1915. Finally, in 1940 this former slave and world-renowned educator was nominated by supporters and then by President Franklin Delano Roosevelt to have his picture featured on a U.S. postal stamp. It was the very first time that an African American was featured on a U.S. postal stamp.